We are thrilled you are considering joining our St. John’s community and are taking the time to explore our website to see if we are the “right fit” for your child. For almost a century, St. John’s has served the educational needs of local families under a mission to nurture and develop the whole child- mind, body, and spirit, and to lay the foundation for a meaningful life. As a P-8 school, St. John’s ensures students thrive as they grow in both academics and values, and begin to make their place in the world. More than an academic program, however, we fundamentally strive to ensure our school is a place where each student can experience the best possible learning environment, can grow and challenge themselves, and can thrive in an atmosphere of respect, inclusion, forgiveness, love, compassion, and generosity toward one another. In essence, we intend St. John’s to be our students’ academic home. This is something I am confident you will see as you continue to explore our school, and talk with faculty, staff, and current St. John’s families and students. I realize this process of finding, settling on, and applying to the right school for your child can feel intense and pressure filled. I want to assure you we are always available and happy to field your questions, to answer your concerns, and help you decide whether St. John’s will be the best educational choice for your child and best community for your family. I look forward to coming to know and work with your family as you continue to consider admissions to St. John the Baptist. Mrs. Hill began her teaching career in Denver in 2004. She is a University of Northern Colorado alumnus and holds a Bachelor’s degree in Literature and History with an emphasis in Secondary Education and a Master’s degree in Educational Leadership. Mrs. Hill is currently pursuing her doctorate in Education. 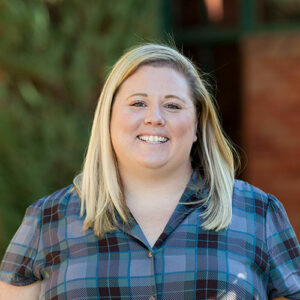 Mrs. Hill is a product of Catholic education and attended Sacred Heart of Jesus Catholic School in Boulder, Colorado. Attending a Catholic school, teaching in a Catholic school and now leading a Catholic school has given her a deep appreciation of its educational benefits. Mrs. Hill believes that Catholic school students learn that excellence is a response to God’s blessings. Catholic education is not only academically rigorous but it also teaches students to help others and make a difference in the world around them. When not working or pursuing her doctoral work, she and her husband Mike love to ski and snowboard. They’re avid travelers and enjoy spending time with their family and friends.